Although most parts of the Royal fort were constructed around 1566 AD by the Mughal Emperor, Akbar the Great, there is a evidence that a mud fort was in existence here in 1021 AD as well, when mud fort and constructed most of the modern Fort, as we see it today, on the old foundations. Constructions of the fort dates back to the early Hindu period. The Royal Fort is rectangular। The main gates are located alongside the centre of the western and eastern walls। Every succeeding Mughal Emperor as well as the Sikhs, and the British in their turn, added a pavilion, palace of wall to the Fort. Emperor Jehangir extended the gardens and constructed the palaces that we see today in the Jehangir's Quadrangle, while Shah Jehan added Diwan-e-Khas, Moti Masjid (Pearl Mosque) and his own Sleeping Chambers. 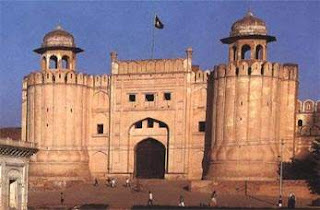 Aurangzeb built the impressive main gate, which faces the Hazoori Bagh lying in between the Badshahi Mosque and the fort. The famous Sheesh Mahal or Place of Mirrors is in the northeast corner of the fort. This is the most beautiful palace in the fort and is decorated with small mirrors of different colours set. The part of the wall of the elephant Steps towards the forts inner gate are scarred by bullet marks, bearing testimony to the Sikh Civil War of 1847 AD. A party of Sikhs had mounted their guns on one of the minarets of the mosque across the courtyard from where they fired on their opponents. the Sleeping Chamber of Mai Jindan houses a very interesting museum with relics from Mughal and the Sikh periods.